It's been such a long time since I did a NOTD post, and that's because I didn't paint my nails for a long time for some weird reason, I did a small break, but now that I got few new nail varnishes I decided to start posting again. 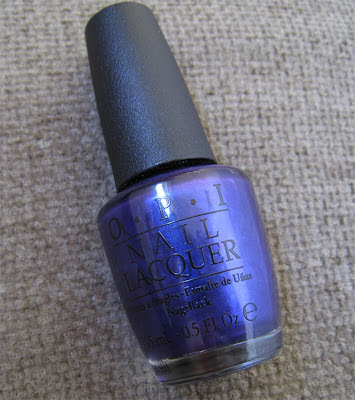 I recently bought two shades from the new OPI Skyfall collection, this time I'm showing you Tommorow Never Dies. I have to admit that it's not one of my favorite Bond movies, but it has a great theme song! Tomorrow Never Dies is a unique metallic deep blue purple shade. I love that the color changes depending on how the light catches it, sometimes it looks more blue other times it looks more purple, this picture was taken with natural light. The formula for this varnish is amazing, very smooth and glossy, OPI never disappoints me! Have you picked up any color from the Skyfall collection? Do you like Tomorrow Never Dies? Let me know! ειναι απλα υπεροχο! must have για τις γιορτες! Αχ τι μου κανεις... Το θέλω!!! This one looks stunning! Great swatches honey! Πανέμορφο είναι!! !Να φανταστείς δεν έχω ούτε ένα μπλε μανό! Spania foraw mple, des mou pane, alla otan exei ligo mwv mesa den exw provlima! poly omorfo fainetai! ego thelo na paro oposdipote to goldeneye! !